When the mood strikes me to cook, get out of my kitchen! Occasionally I get tired of eating the same food and have the time to try something new. Sunday was the case. I cooked roasted peppers, quinoa stuffed peppers, brussels sprouts, broccoli, sea scallops, a small piece of salmon, baked drum sticks (for my family), center cut pork loin (for me), and plain oven baked sweet potatoes (for me). Lol! Was in the kitchen from 1:00 p.m. – 6:00 p.m. On the brighter side- By 7:00 p.m., my meal prep was completed for the week. High 5!! If you’re stuck in a recipe rut, I don’t have the answers, but Pinterest does… at least for me. 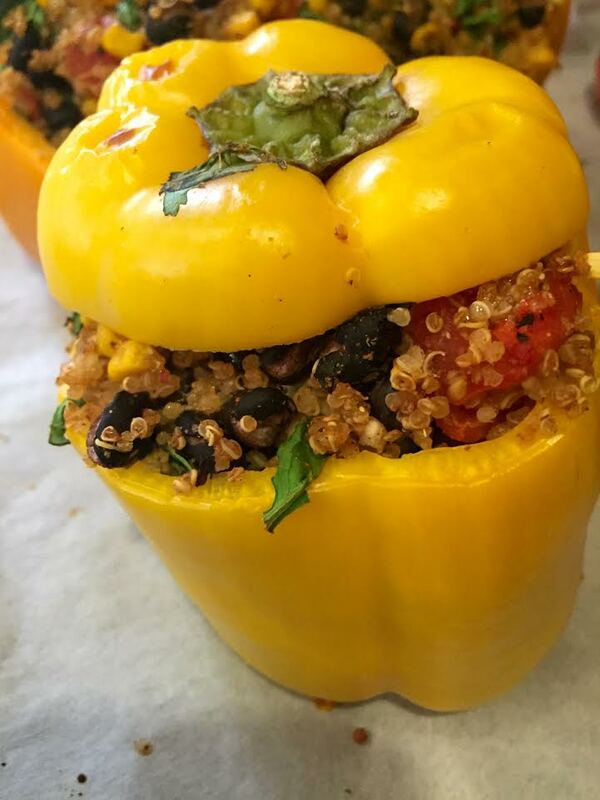 On Pinterest, I can find everything, so if you’re stuck, just search a favorite ingredient like avocado, quinoa, yams, rice, or whatever you’re into. Turkey Meat Loaf – I experimented with a hodgepodge of ingredients. It’s good! Grilled Zucchini – Excellent summer treat! After baking. See what I mean about looking pretty? How could you not want to eat something so colorful and appetizing?! To make food interesting, sometimes it’s just a matter of preparing the food in a different way or swapping out ingredients to infuse the dish with a new flavor. 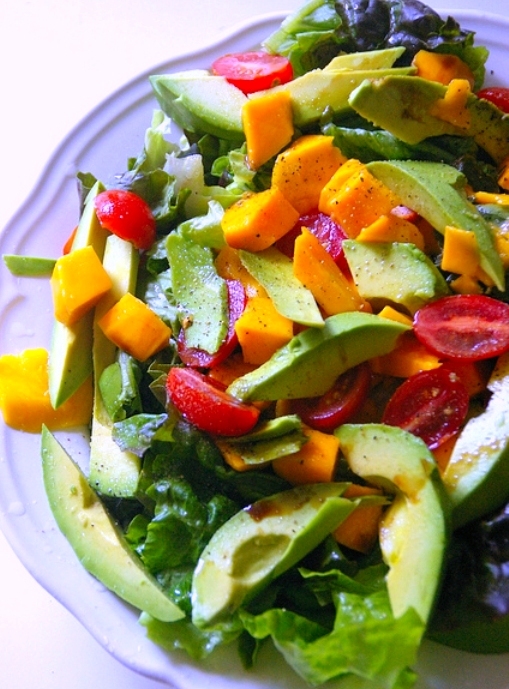 This Caribbean Salad is beautiful! I can’t wait to try this one!! Lastly, be open to try new foods. I’m eating food that I didn’t know existed a few years ago. One of my favorite easy go to is baked spaghetti squash. First of all, it’s no fuss cooking. Second, it’s mild in flavor so you can mix it with just about anything. Third, it’s like eating FREE FOOD!! Lol! 1 Serving ( 250 ml/ 1 cup) of Spaghetti Squash is 33 calories and only 5 grams of calories from fat! Come on!! Why wouldn’t you eat this! Add grilled shrimp, salmon, sea scallops, or whatever else you chose and you’ll have the most delightful meal! Wait one more!! I don’t eat ice cream and haven’t for many years now. Recently I tried a new recipe and Lawd!! I’m in trouble!! I couldn’t wait for my “Healthy” ice-cream to completely freeze, but it was OUTSTANDING!! My version of chocolate ice-cream is from, where else but Pinterest. I ran out of peanut butter, so I added a two teaspoons of the coconut milk. There’s a lot of fat in the coconut milk. I hope that I’ve inspired you to try and to seek out new recipes. If you are on a journey to improve your lifestyle by getting fit and eating smarter replacing your old recipes with cleaner and more nutritious ones is an excellent first step. 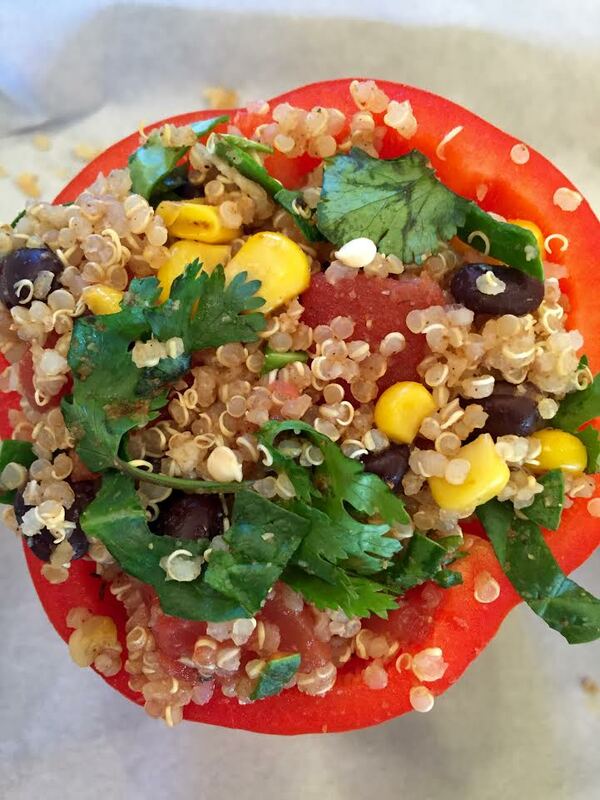 This entry was posted in Family Living, Healthy Eating, Inspiration and tagged avocado, bananas, Bodybuilding, cilantro, CrossFit chick, fit black chick, fit mom, healthy eating, ice-cream, new recipes, Nutrition, nutritious, Quinoa, recipe, rice, stuffed peppers, weight training. Bookmark the permalink. I love Pinterest for healthy recipe ideas. I did notice that you prepped your meals for the week all in one day. That is really a smart use of time. Thank you for sharing how you stay healthy because I want to maintain my weight as I go through chemo. Which sounds weird but, breast cancer doesn’t necessarily cause weight loss despite what many may think. So I will add these tips to my healthy lifestyle arsenal.